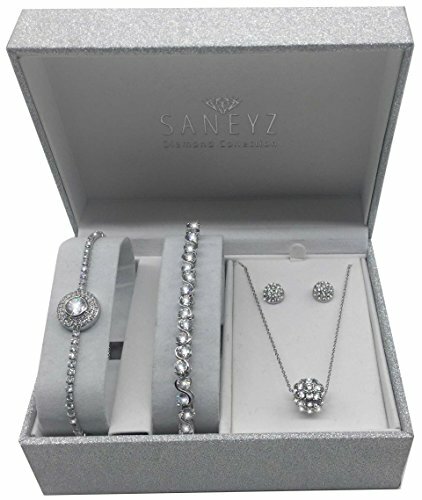 You know you can wear crystal-embellished silver-tone jewelry with everything-but even on repeat, the four pieces from this gift set will look special. Score out-of-this-world shine from our delicate crystal-decked bracelet, wavy linear bracelet, dome stud earrings or dainty pavé pendant necklace. This universally-adored set makes an exceptional gift for graduations, birthdays, holidays or as a personal, well-deserved treat. If you have any questions about this product by SANEYZ, contact us by completing and submitting the form below. If you are looking for a specif part number, please include it with your message.